The exotic woody shrub known as tamarisk or saltcedar has infested the West's river systems, but scientists are divided over how to fight it, or whether it is even possible to do so in a degraded landscape. New Mexico's dried-up, tamarisk-choked Spring Lake comes back to life when the tamarisk is removed, inspiring the Pecos River Native Riparian Restoration Project to tackle tamarisk on the river. 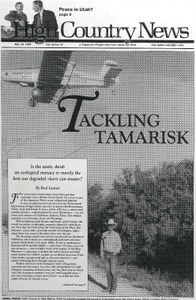 Entomologist Jack DeLoach's proposal to release exotic insects to fight the exotic tamarisk raises questions about the successes and pitfalls of biocontrol. An angler argues with People for the Ethical Treatment of Animals over whether or not fishing is cruel. Snow geese have become so plentiful that they are devouring their Canada tundra nesting grounds, and the U.S. Fish and Wildlife Service wants to greatly increase hunting and bring the population down. Dinosaur tracks found in Red Gulch near Shell, Wyo., indicate that not all the area was under the Sundance Sea during the Middle Jurassic. A survey shows that almost four out of five Colorado voters are in favor of wilderness. A report by the U.S. Geological Survey, "Tapping the Earth's Natural Heat," discusses geothermal power and its possible impacts on the environment. Glen Canyon Institute has an expanded Web site dedicated to the restoration of Glen Canyon Dam. Wyoming's Star Valley Historical Society hosts a summer trek June 26-28 for historical society members. Both Republican senators Wayne Allard and Larry Craig aren't happy about the Colorado BLM's recent reinventory of potential wilderness areas. They'll discuss it June 6 in Grand Junction, Colo. The American Wildlands and the Law Fund is sponsoring a conference on laws pertaining to the environment June 12-13 in Bozeman, Mont. The 11th annual Summer Fishtrap Gathering will take place July 6-12 in eastern Oregon. The Southwest's native frogs are falling prey to non-native bullfrogs and predatory fishes, whose rapid spread is encouraged by man-made habitat changes. The California Dept. of Fish and Game's decision to poison Lake Davis to kill non-native pike has had dire effects on the nearby town of Portola's water supply and economy. Ranchers in southwestern South Dakota and northeastern Wyoming vow to fight a planned railroad extension by the Dakota, Minnesota and Eastern. An Arizona man's mining of red rock to sell to landscapers rouses opposition from lovers of Route 66 and Hualapai Indians who view the land as sacred. Some Utah Navajos say the state of Utah has cheated the tribe of at least $52 million in oil and gas money. Saguaro National Park's recent land swap added 632 acres to the park in exchange for 4,332 acres of land north of Phoenix, and some say the trade sacrificed too much land. A surprising agreement between Utah Gov. Mike Leavitt and Interior Secretary Bruce Babbitt trades state-owned school trust lands in Grand Staircase-Escalante for federal lands elsewhere in Utah - and everyone seems to be happy about it. El Nino has brought an early fire season with a promise of a dry summer ahead for the Northern Rockies, while the Southwest and Southeast are seeing fewer fires than usual.